The OCHS collection currently holds over 12,000 objects, 30,000 photographic images, 30,000 archival items, and 5,000 books and periodicals. 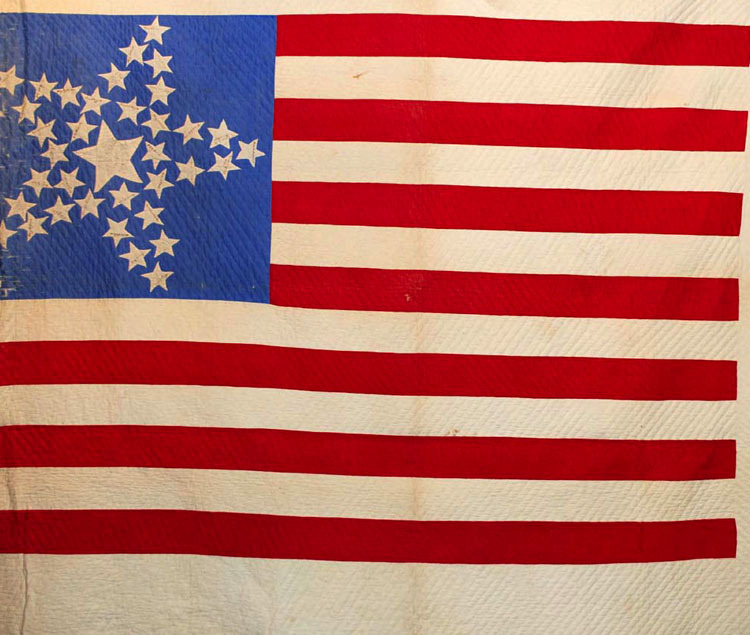 Our vast object collection includes furniture, clothing, agricultural equipment, household items, medical artifacts, military artifacts, fine artwork, toys, and Native American items. This teal green enamel coffeepot was made by the Lisk Manufacturing Co., Canandaigua, producers of galvanized and enameled steel items for domestic, industrial and medical uses. The company was a major employer from 1889 to 1965.
c. 1935, the Dionne Quintuplets with blanket and basket. 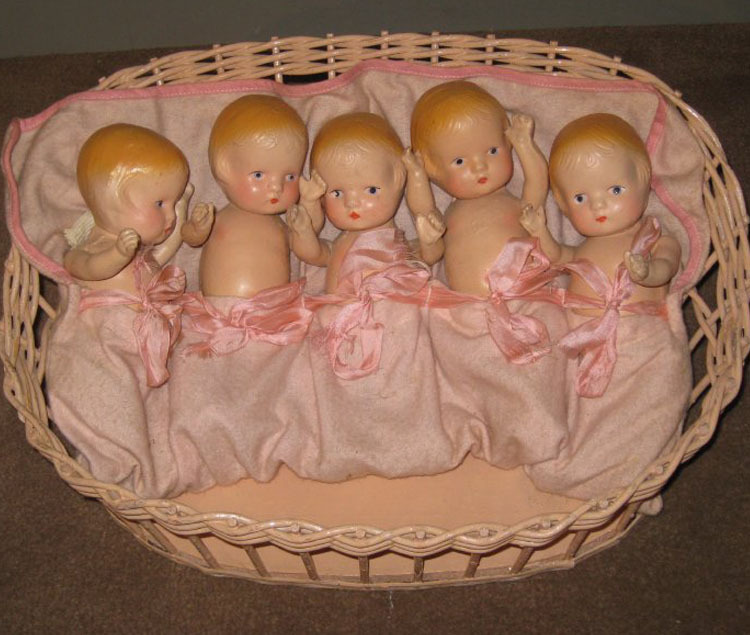 Born in 1934 in Ontario, Canada, the quintuplets were the first set known to survive infancy. Unfortunately, their uniqueness was a source of profit and exploitation by the Ontario government and others. 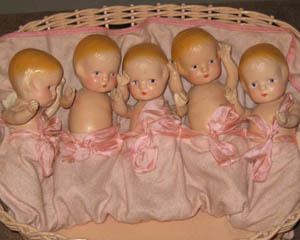 This doll set was owned by Nina Colgrove, Canandaigua. 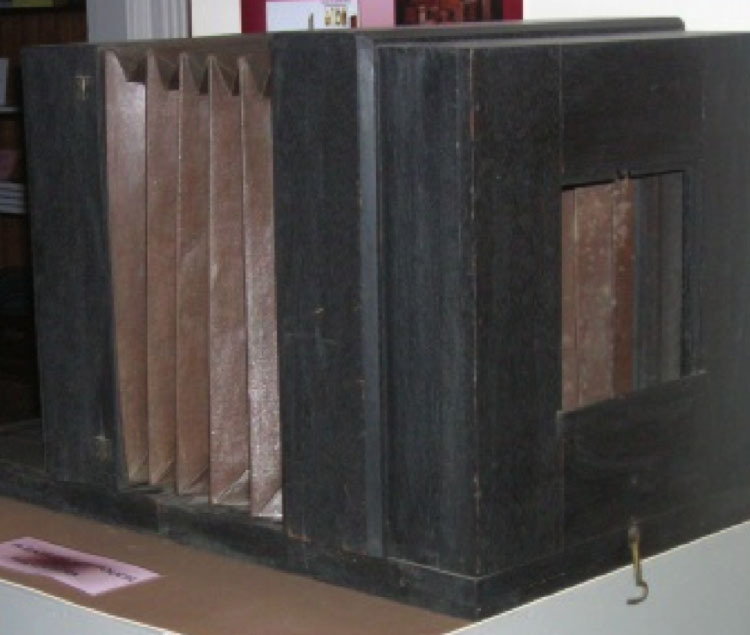 c. 1855, Augustus Coleman used this large studio camera to take some of the earliest known photos of Canandaigua and some of its citizens. 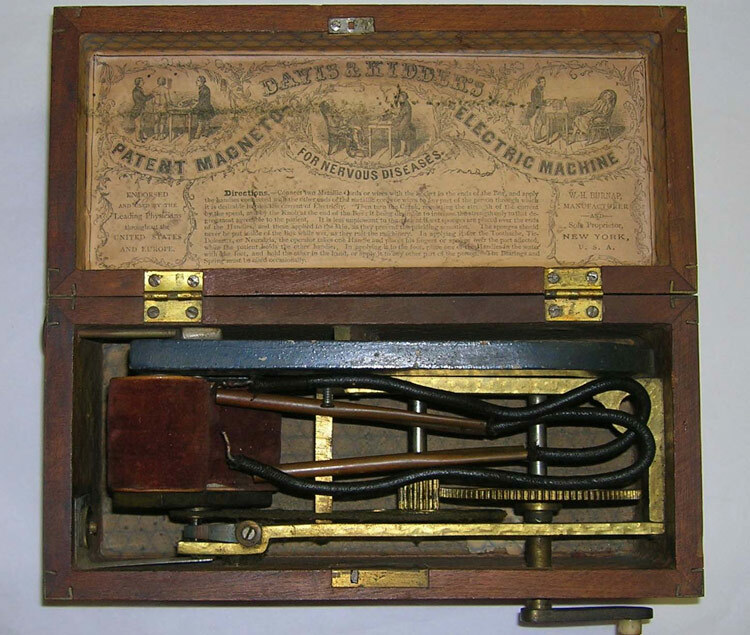 It is made of mahogany or similar wood painted black, with bellows that slide along a base. 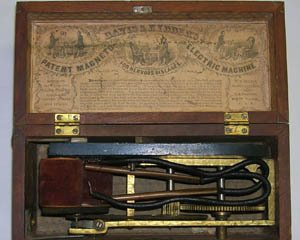 The original lens is missing. 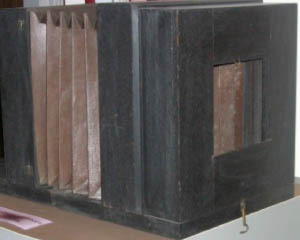 The camera holds 9” x 11” glass plate negatives. 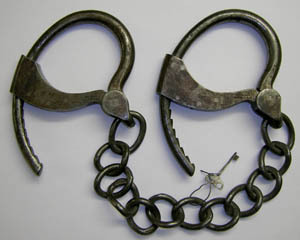 these leg irons were worn by John Kelly of Geneva, NY who was accused of killing Eleanor O’Shea, the housekeeper for his employer George Kippen. Kelly was later tried and convicted of first degree murder. He was placed in the Ontario County Jail in Canandaigua for several months while appeals to commute his sentence of death by hanging were requested and failed. 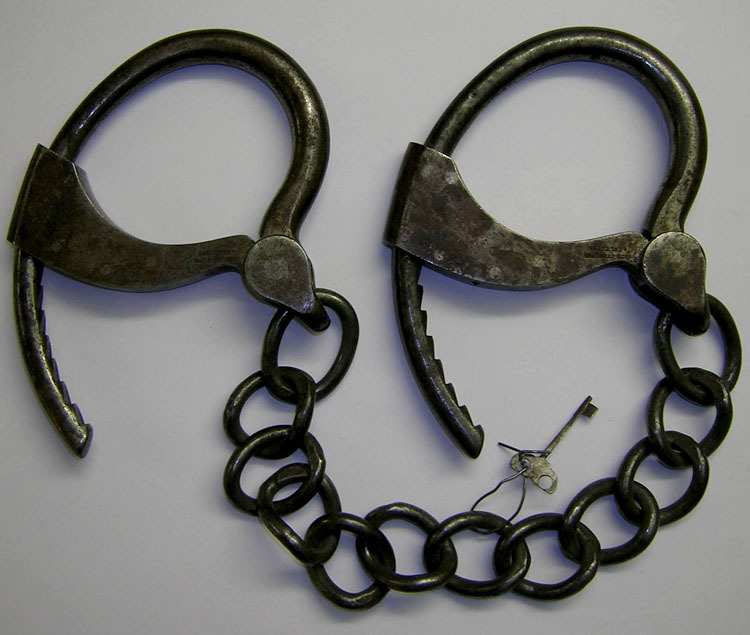 He was hung in the yard of the Jail on July 10, 1889 with a select number of witnesses. 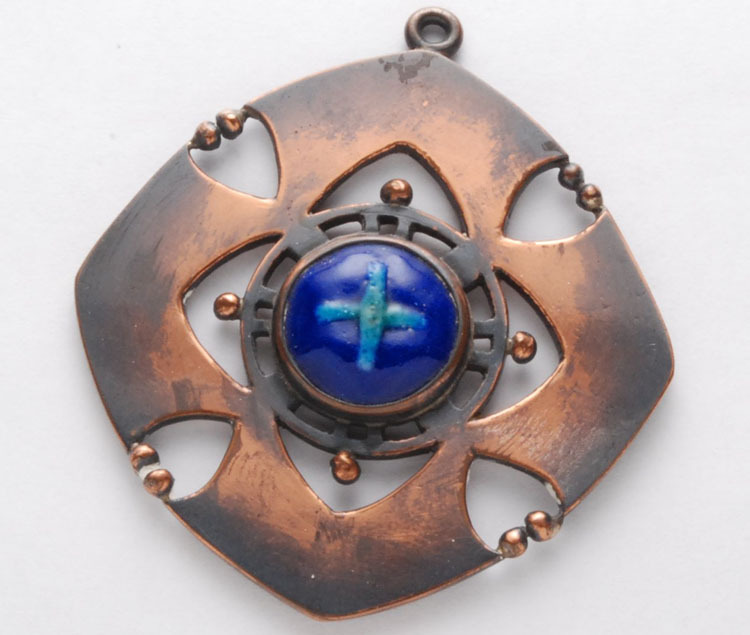 c. 1920, copper medallion with blue stone and blue-green cross of Egyptian paste was made by Erma Hewitt (1882-1970) of West Bloomfield. 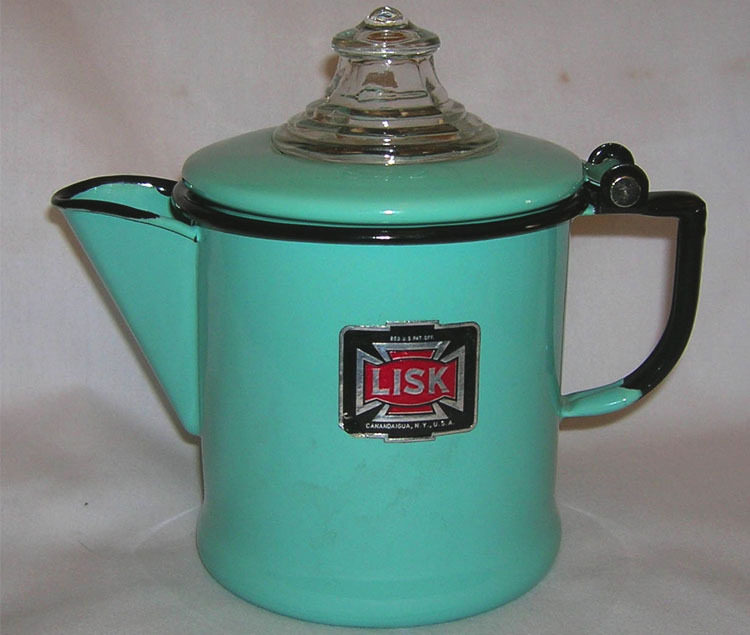 It is one of several pieces in our collection. 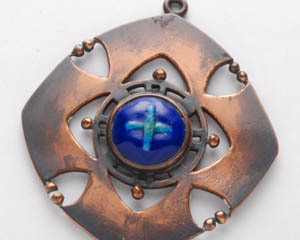 Erma went to the Pratt Institute in Brooklyn, NY where took she took coursework in jewelry, silversmithing and chasing. She also received training at the Rhode Island School of Design. After working in a studio in New York City for three years, she took a position at the Carnegie Institute of Technology in Pittsburgh where she taught metal work and jewelry in the Art Department. 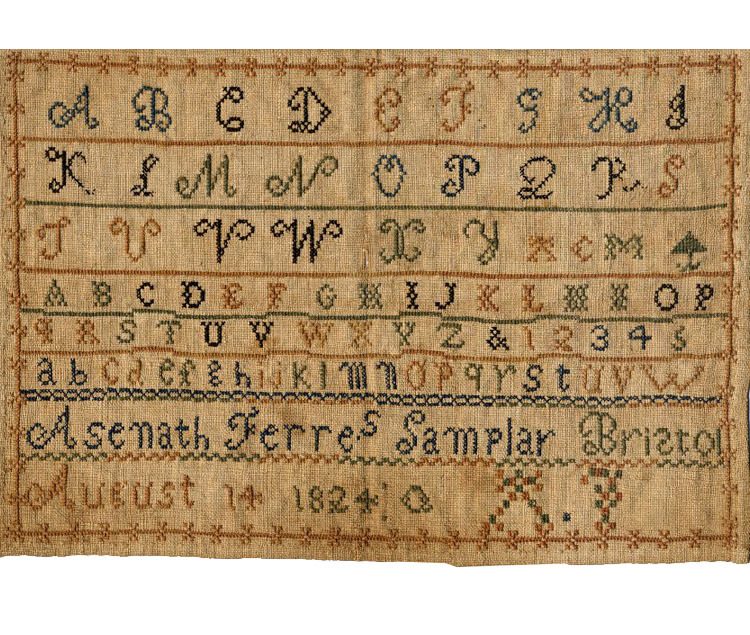 She later took a position at Alfred University as an Instructor of Metalworking, where she remained until 1938. 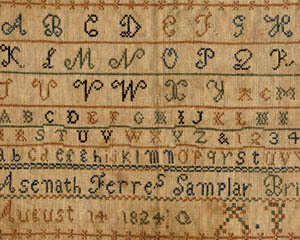 While Erma clearly was a professional woman at a time when most women remained in the home, she appears to have kept in close touch with her family. She frequently visited her parents and siblings in West Bloomfield and later in life, she returned there to live with her sisters. Abbie Clark was the daughter of New York State Governor Myron H. and Zilpha Watkins Clark. Governor Clark served in the 1850s. Her sister was Mary Clark Thompson, former owner and summer resident of Sonnenberg Gardens. Oil portrait of Joshua Stearns (1832-1864) on back of canvas “J. 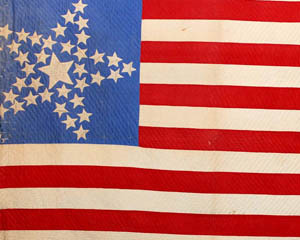 W.. STEARNS/painted Feb 4th 1843/AE 11/D. 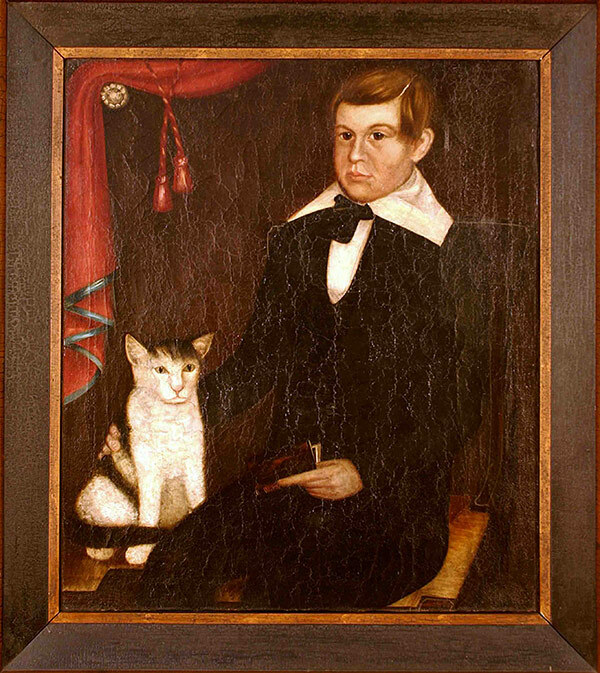 J. Kellogg P. T.” The portraits of Marshall, Elizabeth and son Joshua Stearns (shown here) are fine examples of 19th century folk art which emulate the wealth and status of this family. Note the fine clothing worn by each individual, the heavy drapery in the background of two of the paintings, and the books as symbols of knowledge. 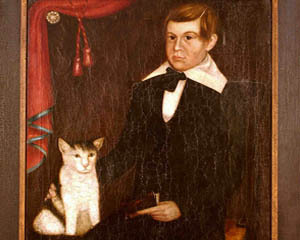 Often children were painted with a favorite pet such the boy’s cat. Although little is known about this family, it appears that Marshall Stearns was a successful farmer in Gorham, NY for much of his life. The farm was located on the corner of Kipp Road and Middle Road. Their son, Joshua, worked the farm with his father until his death at age thirty-two. 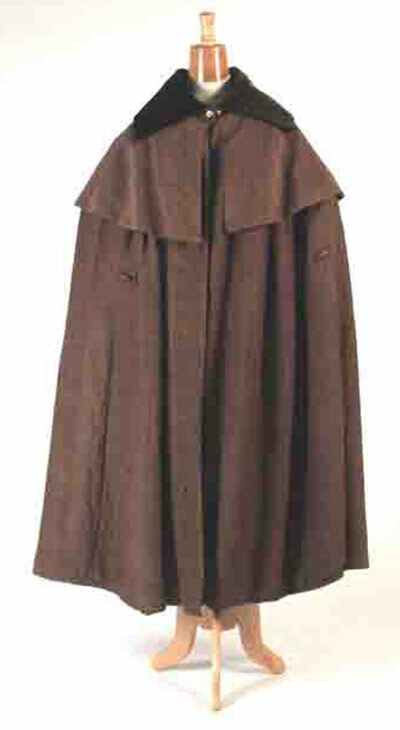 c. 1785-1795, this finely made, dark brown camlet cloak with velvet collar belonged to New York Governor Myron Holley Clark’s father, Joseph Clark or possibly his grandfather, William Clark. 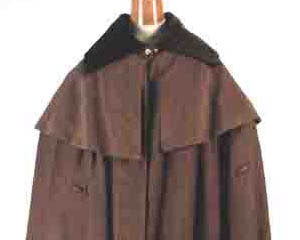 It may have been made by his mother, Mary Sutton Clark, a noted seamstress in Naples, NY. 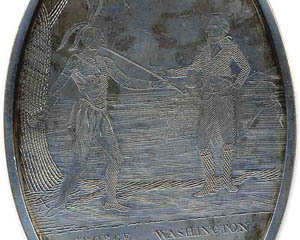 Myron Clark was governor from 1854-1856.
silver Peace Medal has etching of Native American with pipe on the left and George Washington on the right; also engraved on front is “George Washington President 1792″. On reverse is etching of an eagle. The United States government gave medals to the chiefs of the various Iroquois nations in commemoration of peace treaty negotiations. 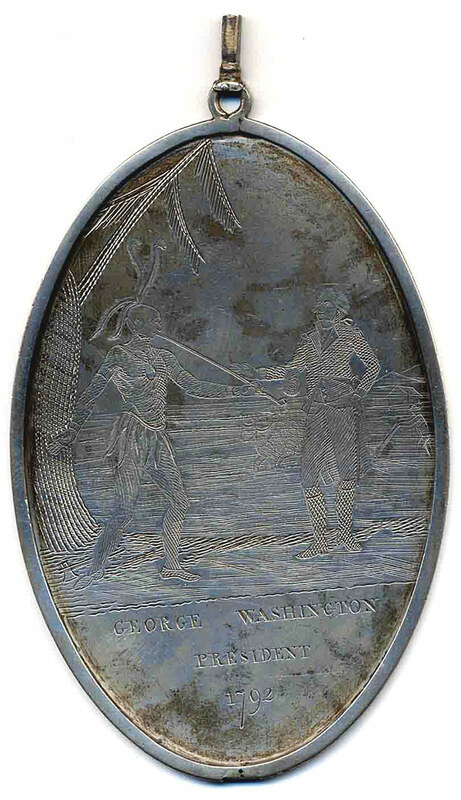 This medal is believed to have been presented at a meeting in Philadelphia, Pennsylvania, 1792.